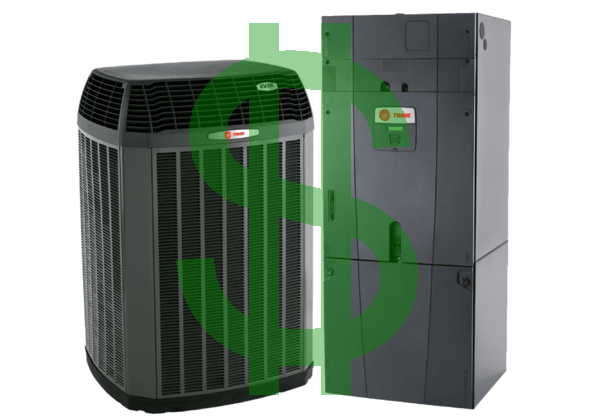 We are SMW Refrigeration and Heating, a Trane Comfort Specialist, and in this post we’ll cover how much it typically cost to have a new residential Trane air conditioner fully installed. The factors that determine the cost of getting a new A/C is the tonnage, efficiency, brand (were focusing on Trane), discounts, rebates, and we’ll tell you everything we do when we install and what to expect for a professional installation. On average a single Trane air conditioner sells for a price range of $4,000 to $12,000 after installation (there are better deals for multiple units). It depends on the tonnage (ranges from 1.5-5) and SEER rating (ranges from 14-20) of the unit you get and there can be an optional additional cost for things like an air scrubber, extended labor warranty, extended PMA, zoning, insulation, and duct sealing. Before getting a price we recommend scheduling an in-home-estimate and getting a heat load done. We do them for free and it will help you figure out what your home needs. Also if you’re dealing with something like a hot room or high electric bills its always good to have an expert in your home to find a solution. There are several important factors when it comes to determining the cost of your unit and before you can get a price you have to figure out a few things about your home and what you need. First, a very important thing you need to know that will impact the price of the unit is if it’s sized correctly. Air conditioners are sized by tonnage which is a measure of how much heat it can remove from your home. Tonnage is sized by one ton per 12,000 BTU’s (British Thermal Units). Residential units get as big as 5 tons but always remember just because it’s bigger doesn’t mean its better it just depends on the heat load of your home. In order to determine what is necessary for your home a heat load calculation must be done. Your homes construction and geographic region is what affects the calculation for determining the proper tonnage. Once the heat load is done we typically find that homeowners can get away with a smaller unit on their home which can save them money on initial investment (smaller units are cheaper). Another bonus of the heat load is that if you have 2 units on your home, sometimes we find that your home can get away with one large unit and zoning it. 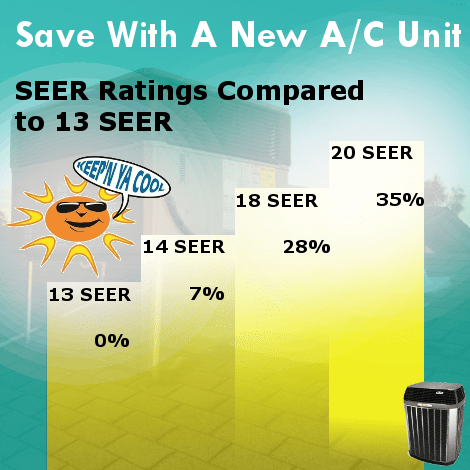 The next important cost factor is how efficient the unit is, in Arizona the rating you’re looking for is the SEER rating or Seasonal Energy Efficiency Ratio since your unit is mostly needed for cooling. It’s a ratio of total cooling output to the total energy input over a given cooling season. The more efficient the less electricity your system needs to do its job, making it a cost-effective investment because you will spend less on utilities and you will make money back on your investment in the long run. All air conditioners must have at least a SEER rating of 14 because it’s been mandated by the Department of Energy. There is also the EER or energy efficiency ratio that will tell you how efficient the system is but it’s not measured over a range of conditions for a season it only uses standard conditions for the temperature and humidity. It’s still good to look at but SEER is more necessary for the extreme heat during the summertime in Arizona. For Trane, the highest SEER rating is 20 and the highest EER is 13. You can read more about SEER on the AHRI website and inspectapedia. The efficiency of the system is affected by the components that make it up. 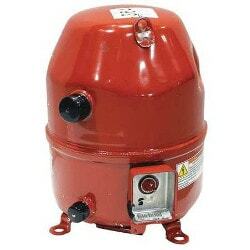 For Trane, the compressor and blower motors can be variable speed or operate in 2 stages and they have communicating systems where all the components send performance data to the thermostat that then improves performance to produce the most efficiency possible. Most companies just use a standard Copeland compressor but Trane has developed their own Climatuff compressor, its superior in durability, produces low noise levels and is very efficient. They even have their own coils, the Spine Fin Coil, it’s all aluminum which makes it better at resisting corrosion and it’s designed to improve heat transfer. You can learn more about Trane products on their website. You might also be interested in the AFUE and HSPF if you use your heat (a lot of people avoid using their heat in Arizona). The HSPF or Heating Seasonal Performance Factor measures the heating efficiency of heat pumps as a ratio of BTU heat output over the heating season to watt-hours of electricity used. An interesting thing about the heating efficiency of heat pumps is that they are more than 100% because they produce more heat than the electricity they consume. The AFUE or Annual Fuel Use Efficiency is a measure of efficiency for gas furnaces as a percentage of how much fuel is consumed that is converted to heat. The higher the percentage the more efficient they are, typically in Arizona people get the 80% furnaces because heat is seldom used. The brand of unit is important because each one has its own level of quality, durability, efficiency, and performance they can deliver. Each one also has its own terms of warranty and guarantees they come with. The efficiency and performance they deliver will affect your initial investment and your return on investment. Take some time to do research on them and see what others experiences were. Brands with cheaper units typically use cheaper parts which in the long run can lead to breakdowns a lot sooner than a better-quality unit. We chose Trane because of how reliable they are and the warranties and guarantees they come with. They develop their units to be the most reliable and push them to the limit with extreme conditions testing at their SEET lab in Tyler, Texas. Plus most Trane units come with a 10-year parts warranty and they give us a 100% customer satisfaction guarantee. If SRP or APS supplies your electricity you can get a rebate back for your new unit. The rebates offered by them change so make sure you check their current offering. As of February 2018, SRP offers $400 for units with a rating of 16 SEER or higher, $600 for 17 SEER or higher, and $800 for units with a variable capacity compressor. APS also offers a rebate for $200 depending if our install meets APS Quality Installation Standards. We have done a good job meeting their standards and have been one of their top ten contractors the past two years in a row. You can check current rebates here for SRP and APS. There are also some discounts and bonuses we offer that can help with the cost of a new air conditioner. Not everyone does this but we offer a $200 referral bonus when you refer someone to us that buys a unit. A lot of our satisfied customers refer their friends and family who buy units and in turn, they make $200 back on their investment with us. Getting a new unit is valuable and we want to do a good job for you so we are even willing to pay for a referred customer. We also have customers who own a Preventative Maintenance Agreement with us and they get 10% off for new equipment. We always deliver a proper and professional installation, it’s important to us because we are a Trane Comfort Specialist. If someone can replace your unit for cheap, then the installers are probably just changing the unit out. There is a lot more that needs to go into an install, especially if you’re looking for a professional installation and a unit that is going to last. For example, when installing split units a lot of people make the plenums out of duct board a flimsy non-reliable material while we always fabricate sheet metal and we run new duct for the return side. For package units we do a new stand, elbow, and transition. For both types of units they should also do the disconnect box, make sure your drain line is clear and add necessary connections, change the filter frame, add vibration isolation pads (if noise is an issue), seal new duct connections, provide crane service if necessary, check and change low voltage connections, seal all roof penetrations, remove old equipment and dispose it, and something special Trane does is they back us with a 100% satisfaction guarantee! Always choose a good contractor, it’s important that your new air conditioner is installed by someone that takes pride in their work and does a professional job. Take some time to look up contractors online and check their reviews. Nowadays everyone has the ability to voice their opinion online and rate how well a contractor has done. If they have bad reviews about their installs and service, chances are they aren’t going to be a good choice. If you’re in the Phoenix area look up SMW Refrigeration and Heating, we have awesome reviews!